New London County, c. 1780. H: 32", Case Width: 32.75", D: 20”. Side overhang of top: 3.25". Cherry, white pine. A recent discovery, the chest was found 20 miles north of Norwich, Ct. First time on the market, and in fine original condition, including original large brass hardware. Minor repair to 2/3 of bead on bottom of right proper front foot. Exhibiting a bold concept and dynamic proportions this chest has design and construction features consistent with the Norwich school, possibly the circle of Felix Huntington, (1749-1822). A similar chest displaying the identical vertical inlay on the drawer fronts (suggesting a blocked facade), and recorded as Norwich, is featured as plate # 50in "New London County Furniture, 1640-1840", Lyman Allyn Museum, 1974. 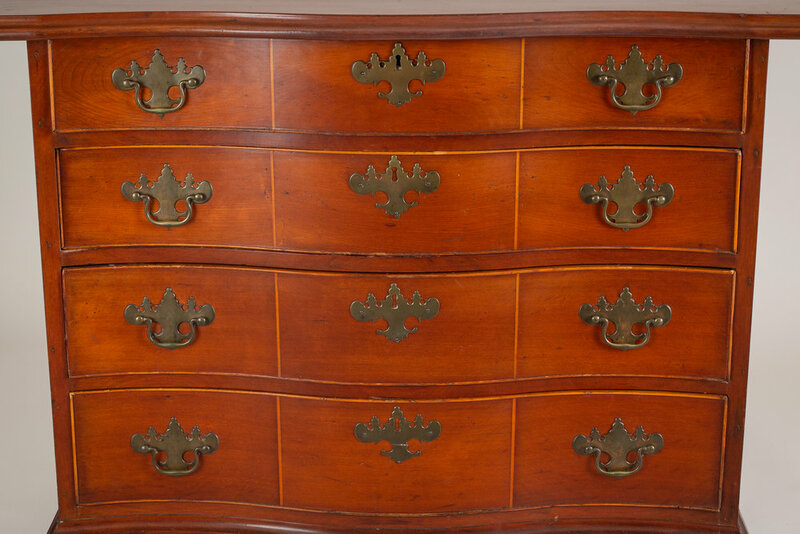 The dovetails exhibit the same profile as other New London County chests, and the original brasses are identical to the brasses on the documented Felix Huntington desk New London County Furniture, pl. 58.